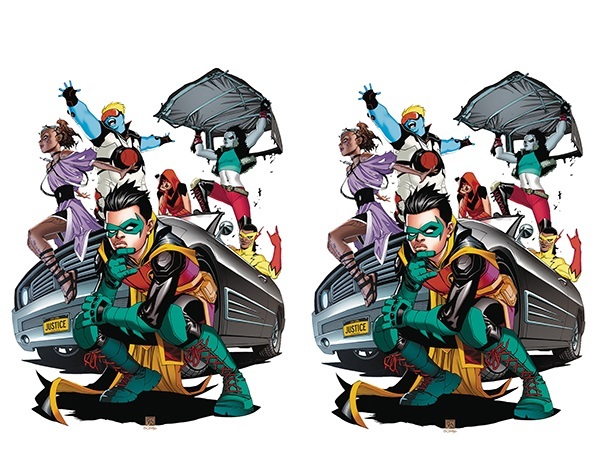 DYNAMIC FORCES® - TEEN TITANS #20 SIGNED BY BERNARD CHANG DUAL PACK! TEEN TITANS #20 SIGNED BY BERNARD CHANG DUAL PACK! FIRST APPEARANCE OF LOBO'S DAUGHTER! Batman has no idea what he's doing. Superman? Not a clue. Wonder Woman? Whatever. Damian Wayne is Robin, and he's done with the bleeding-heart approach favored by the heroes of the senior circuit. New plan of action: recruit a new Teen Titans. Kid Flash, Red Arrow and newbies Roundhouse, D'jinn and...wait, Lobo has a daughter? That'll end well. And then build something in secret deep beneath the new Teen Titans HQ. Secret from his teammates, secret from even Batman. It's a secret that will change the way you look at Robin forever! COVER NOT FINAL. Event priced at $19.83 for the year Lobo first appeared in Omega Men #3!